Hi clubin, do you think the ddm side pipe will fit with this asguard body? Latest of mine, just thinking of how to paint it. I can't confirm that. There is lots of room under that body, but maybe sombody will chime in that is running that combination. here's my tt, I also have a rampage pro4 short course truck. it has proline desperado's and badlands, vertigo 8mm hpi hubs, mooman modded diff cups, steel gears, a 35cc obr full mod motor, custom 3/8 6061 aluminum cage/shock tower brace and maybe a few other things... other than that it's stock. thanks to redcatrampageforum.com, davesmotors.com, largescalerc.com, mooman007uk, obeast44. nanoali, I have 2 asgard bodies for my truck with a sprint77 modded rear dom but I sat one on my tt with the side dom and it looks like they would work with just a hole in the drivers door for the exhaust exit. dont hold me to it for sure but it looks good, might need some heat tape to protect the body from the pipe. this body is big and wide. thanks guys for your fast replay to my qst. if you told me that with a little hole at the side this will fit, is a good new to me and make me happy so i dont have to cut much the new body. im waiting for the fs hop up asguard body of fiberglass and kevlar. even the rear wing of the mcd baja 1000 and decal sheet too. i will post picture as soon as i have it. @ Ron E: that body looks nice! Lol and i want one of thats roll cages what did you put on the side of the bodys to hold it to the chasis? or you just hold it from upside (stock mt body posts)? Hello everyone, well I just got me the Redcat Rampage MT5 Pro. My question is I'm tring to figure out the th/brake linkage and I was wondering if anyone could post a clear pic so I can the this baby out running. Thanks in advance!! There should be a breakdown in the manual. There should be something in the manual. I'll try and get a pic of mine tomorrow and I'll post it up. just got the new version 3 from Rob.....man....this truck is HUGE!!!!!! Well, I guess this is the combination to beat for the money. 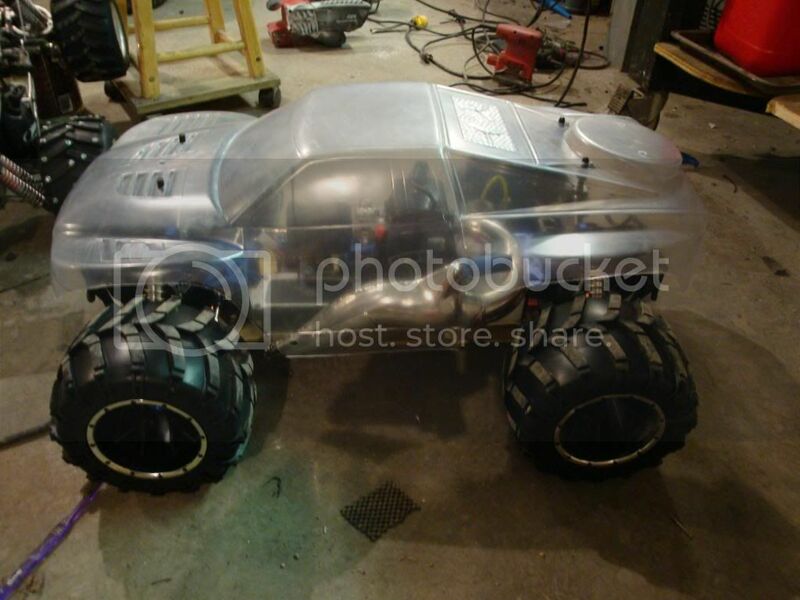 Take one Redcat Rampage Truck, add a 29cc head kit, and an X-can. Total cost is around $1100 MSRP. The head kit took about 45 minutes the first time, and was easy to do..
Its just getting tuned up, but its scaring the neighbors already. I can see this being addictive. I used the small x-port and eventually settled on the 3" stingers. The 6" stingers vibrated loose too often. Nice one Frumpy. Love the angled tips. Are any of you guys haveing problems with the clutch I have tore this truck all apart and rebuild it put all new bearings it roll smooth no binding at all but when i run the truck with in two mn of running the clutch bell is smoken hot hpi 8000 spring and shoes and it has no power vary boggy could my clutch bell be bad? and this truck is new 28.5 cc dom pipe. And i check all the set screws I have about had it with this truck!!!! If ther eis no binding, I would say its a glazed clutch bell. Once it gets glazed, you have to take it out and sand it. And then probably buy new shoes.